Garages - Our Garages are built to last. Using 12 or 14 gauge galvanized steel allows for a strong, customizable, metal garage. 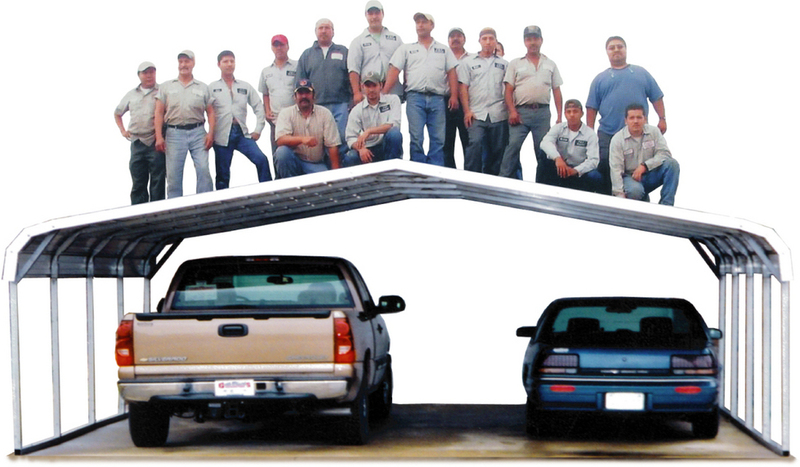 We have several options and styles available for our certified and non-certified Garages. Options like widows, doors, and extras for your Garage will give it the accessibility you want on your new metal Garage. A-frame with Vertical Roof - An A-frame garage with a vertical roof is recommended by us. The vertical roof allows water and debris to easily flow off the sides, and the A-frame style looks sharp too. * $2,460 prices a 12'x21'x7' regular style garage with one 8'x7' roll up door. Prices may vary by area. Prices are subject to change without notice. Garaged doors - We offer several standard sizes of garage doors along with the availability of most custom sizes. If you want your own custom door, we can frame for it for you.